Now that developers have their paws on the developer preview of Apple’s OS X Mavericks, we’re starting to see demonstrations of the new operating system’s capabilities appear outside of the safety of Apple’s keynote address. Via YouTube, one user with a sweet-looking six (!) 27-inch monitor setup goes through the pros and cons of Apple’s new full-screen app support within a multi-monitor configuration. Depending on how extensive your monitor setup is and how much you used Mountain Lion with multiple monitors, the new functionality in Mavericks will either be great or drive you a slightly insane (particularly if you have strong feelings about wallpaper). MrThaiBox123, the YouTube user who uploaded the video of Mavericks multi-monitor in action, demonstrates how a full-screen app in Mountain Lion would blank out all of the other displays except the one where the app was at full-screen. The wallpaper would be replaced with a dull gray color. In Mavericks, this doesn’t happen. Instead, all of the screens retain their wallpaper and, presumably, everything else that’s hanging out in the other monitors. This particular developer is a huge fan of wallpaper that is unified across the all the screens and demonstrates how that’s currently impossible to achieve in Mavericks – unless you revert back to Mountain Lion’s multiple monitor scheme. 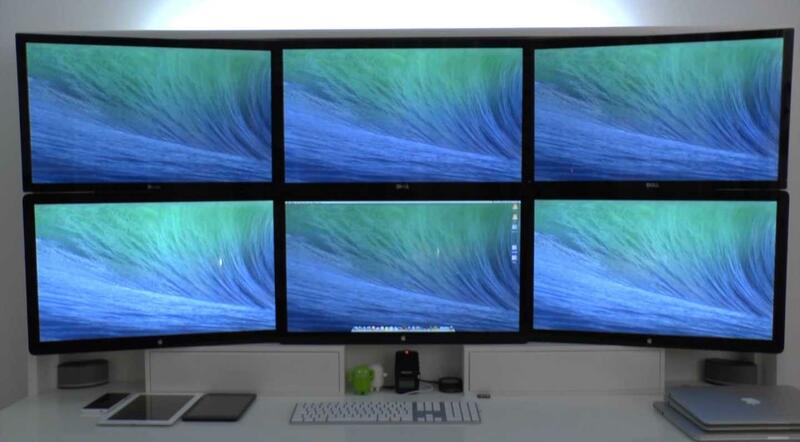 This could all change before Apple releases OS X Mavericks to the general public this fall, but it’s certainly nice to see how Apple’s changed its multiple monitor support with the new OS. Check out the video below and let us know what you think.